Sorry, I'm lost here. Clearly, you're not in any mood to argue anything cogently so I'm not going to press you on that but be reassured, I certainly don't see how it could possibly follow. No, the intelligent force I say is in evidence for all to see is not the Christian God, nor any god for that matter, nor any kind supreme being. So, when exactly was I brainwashed? And by whom? Sorry, but I now have the experience that whatever intelligent force there is definitely doesn't lie with you so there's no much point trying to argue anything with you. You prove it again here. You're not even discussing what I say, you just jump on what you see as an opportunity to repeat your trite ideology. "We" certainly includes most people, and all intelligent people. "We" doesn't include complete idiots but they're not that many. Please don't be so contemptuous when you are yourself being the one misinterpreting what is said. If the universe is simulated, we, who are part of the simulation, realizing that would break the simulation. The point of simulating things is to answer the question 'what if ___.' I cannot imagine any way having simulated people being aware that they are simulated would help answer any question, except 'what if our simulated people could know they were simulated!' Again, what is the point? Thanks so much for the link to this article. But since you need to subscribe to read it all I was able to find what seems to be the same article here in its entirety. It has a very interesting approach to explaining quantum effects that is based on the reversability of the laws of physics, which I've been thinking of quite a bit lately. I hope to be able to cite it in the Natural Science forum (when I have time). Thanks again. Thanks for finding that copy. I wonder if that theory could involve intelligent information going back (e.g. the Interstellar movie). Or just information that "fits" the sudoku puzzle. No it is the opposite really. I don't want to take Jesus seriously. I don't want to seek God (besides reading books for and against Christianity). I don't want to reach out to God and see if he's real. I think I'd be ashamed to try and promote Jesus to other people. Though in high school I did promote YEC in an intellectual way. The thing is though that I think these songs are compatible with a highly liberal version of Christianity - like MLK believed in - where Jesus may not have literally rose from the dead, etc. The songs on the radio could be explained as chance better than the Maundy Thursday service songs. If it hadn't been on the radio I probably would be dead so therefore it is expected that those songs would have played. I'm still VERY reluctant to do much about this. From what I can tell, this intelligent force isn't promoting traditional Christianity as a whole, just some aspects of it. Hmmm... it seems me having communion is significant though. BTW my wife got me to eat a cracker with a service a few months ago and after the service I heard "Daniel" by Elton John on the radio which is quite significant - I know many Daniels (long but very interesting story), I know hardly anything about the book of Daniel and my wife has had a few boyfriends called Daniel. There is an ebook I have called "Godless" by Dan Barker which I read every now and then. When I talked to a friend of mine who is studying theology about Dan Barker he immediately wanted to change the subject. I don't know of other Christians (including my pastor) who have heard of Dan Barker. I can learn a lot from Dan Barker but he might not be correct about his probable belief that no intelligent force exists. Last edited by excreationist; 09-21-2018 at 03:55 AM. I have been watching his videos on Youtube but am unaware of what you are talking about. Anyway he seems to be highly intelligent. He could be the main reason why people could be going to Mars in huge numbers soon. 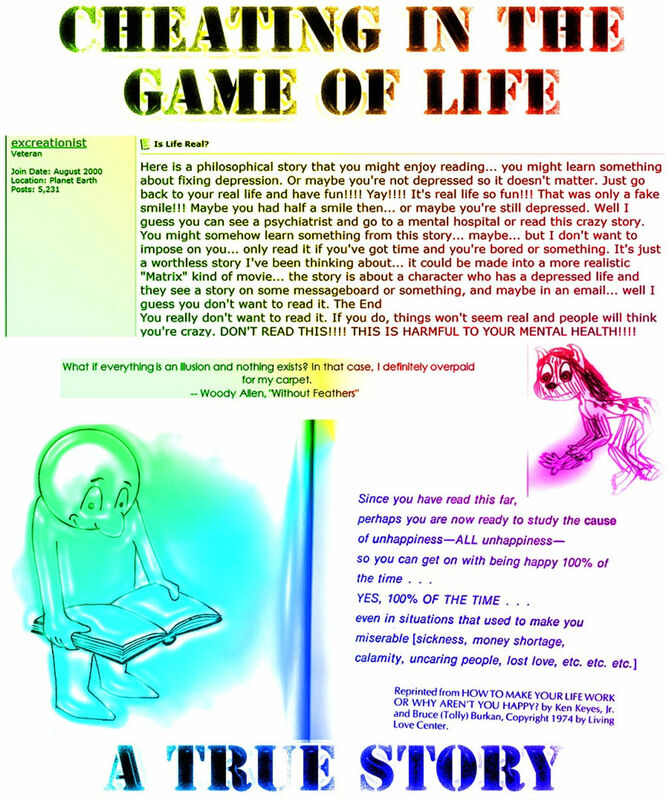 In 2008 I was in a creative writing class for people with mental illnesses. I wrote poems, made a comic, and wrote a true story that is mainly about an event earlier in my life where I later was hospitalised. Then it also covers my suicide attempt. I initially was trying to hypnotise people who were reading my posts but I ended up hypnotising myself and eventually became catatonic. At the time I believed that I was in a computer game a bit like the Matrix. Back in the December of 2005 I wondered if life was real. Were we perfect gods who were playing hide and seek with ourselves through the game of life? Back in the year 2000 I also questioned reality. I read books by Ken Keyes about how to be content with life all of the time. I came to believe that I was a perfect viewer watching the drama of life unfold. By having loving preferences rather than demands, only positive and neutral emotions remained. His books said to just play out your normal role but I thought I could help the world more by changing into whatever personality I felt like at the time. I think that we secretly crave threats to things we care about otherwise life can seem boring and meaningless. I think that’s why I put myself into riskier and riskier situations. I ended up trying to help criminals in [.........] become happy but after visiting the police too many times, I was taken to the hospital. In the December of 2005 I had been off of my mood stabilizer for about 5 months. I wrote on three different internet messageboards – [.........] – which was mainly populated by those who don’t believe in any gods, the [...........] boards – which is made up of men who want to be courageous men rather than miserable doormats. The third messageboard was on [.............] which was a website where people shared expensive videos and files related to picking up women. At that time I became more interested in [.........] ebooks about David Deida’s ideas about masculine and feminine archetypes and the King-Warrior-Magician-Lover system. I also learnt about the Myers-Briggs personality system which has 16 types. For at least five years I had been interested in kabalarians.com and thought it was very accurate. It is based on a type of numerology where letters in people’s names are converted into numbers and then in a personality profile. I started making my own personality systems using diagrams based on 4 parts and was encouraged when I learnt about mandala’s which are pictures supposedly based on our underlying reality which had 4 main parts. This got me into thinking that reality was ultimately based on symbols – like a computer game’s code. And computer games often include cheat codes and if they don’t the game can be hacked. I had also read about hypnotism and set about writing hypnotic messages on the messageboards to try to pull the readers into a fantasy world where normal physical limitations didn’t apply. I heard that about 10% of people are able to be hypnotised so that anything can be made to disappear before their eyes. Those 10% were who I was particularly interested in. I typed in for the title. I then typed a long message where I tried to guess the readers’ thoughts in the hope of gaining their trust. I posted the message on all three messageboards, using capital letters to try and hammer in my words. I posted the next message expecting that my messages would allow people to realise first-hand that life was like a computer game and that it would either make the world’s news or be suppressed as soon as possible. I wanted extra help in the game of life in the form of a genie. Perhaps I would get a phone call soon where the game is surrendering and offering to grant wishes. I had a headache and was sweating a lot and put that down to the game trying to protect itself from cheaters who might spoil the experience for others. I would just drench my head in water to stop overheating – I don’t remember drinking water. USING THE LATEST NLP AND HYPNOSIS TECHNIQUES, I'M GOING TO TRY AND TAKE OVER YOUR MIND. I typed on, while not considering that I could be one of those hypnotized readers. IF YOU READ ON, YOU WILL BE LOCKED UP IN A MENTAL INSTITUTION BECAUSE YOU ARE INSANE. YOU DON'T WANT TO BE INSANE DO YOU? I was worried that people from the hospital would be taking me away soon so I had to hurry and get this finished. I complied with my own command since there didn’t seem to be any people from the hospital around at that moment. I looked on the wall above my computer to check to see if the picture was still there. I assumed some readers out there didn’t see what I’m seeing yet – I thought they should keep on typing like I was. I made that message appear on the messageboard and then typed some more sentences about what was happening or will happen such as the phone ringing or the sound of thunder. I decided that I’d pressed enough buttons. I kept on describing more things that I could see. Then I tried to change what was happening around me just by thinking. I wished that a girl called [T] would appear behind my bedroom door. She was about 3 years younger than me, with straight, long, brown hair and deep brown eyes. When I was at university in the year 2000, she lived in an eight-bedroom flat with me. She didn’t appear. I decided to wander around the house. I wished life was better. I wandered past the kitchen. The sky outside seemed brighter. I walked to the back door. Then I turned around and saw a girl who looked a bit like [T] sitting at my Dad’s laptop. I later realized that she was a family friend from Germany. The appearance and behavior of the girl who appeared sitting at that computer wasn't what I wanted. After going towards her I retreated. She started to smile and say “what?”. I liked that so I moved towards her again. She then seemed uneasy and withdrew a little so I did too and the process repeated a few times until I was moving so close that her face was filling up my view – I was almost kissing her. I gave up on the girl by the laptop and wished that a genie would appear to grant me wishes – or at least that there was help for dissatisfied customers. My wishes didn’t seem to be happening so I thought I’d give up temporarily by lying on the ground and closing my eyes. I rose to find things about the same so I lay down again. I did this a few times then went into my lounge room. I continued to stand up and lie down until I met a bearded man (who I later realized was my father) who was offering what I saw a cup of life-giving fluid. I went towards him a little to encourage helpfulness in the game but then retreated because I didn’t feel like a drink at the time. He also offered food but I refused it too. I lay on the floor again and instead of getting up and lying down I’d just move my arm back and forth which represented me seeking or avoiding aspects of my present experience. I later would shake my head left and right and then just think in dualistic systems such as yes-no, left-right, one-zero, and black-white. Lying on the ground I overheard a conversation – two men were talking about my history of bipolar disorder – they were actually my Dad and an ambulance officer. Things seemed to just get worse and worse so I thought I’d just try and die by lying down and keeping my eyes closed. Later on my Dad said that he couldn’t lift me because I was too heavy. Then I appeared in the ambulance – I later found out that I had been lifted off of the floor and onto the stretcher. I moved and thought to myself in those two-word systems (one-zero, on-off, etc) in time to the two-tone siren and heart-rate monitor. I wanted to have everything I wanted with just a tiny hand gesture. With my eyes closed I thought that I’d soon be bored of that and perhaps indulge in cruelty. I thought of the implications of being selfish and cruel – it meant that I had an evil heart. In my deepest thoughts I was Satan. A year later I even went around in public saying I was Satan and offering to grant people wishes if they’d do me favors. But that’s another story. Back in the ambulance, on my left, was a lady that I again thought was a non-perfect recreation of [T]. According to the files I obtained under the Freedom Of Information Act, I wanted to hold her hand. Perhaps I reached out to her to communicate that. I blacked out again and went back to going back and forth between two opposites. I wondered what structure reality had. I thought about the yin-yang symbol. Was reality a battle between two opposites? I then thought about a very complicated flower image that looked like it was made up of three main loops. I can’t remember what those three loops meant exactly. Maybe one was the “right-hand path” of being a humble servant, the next was the “left-hand path” of being self-centered, and then was the “middle path” which I think involves respect and equality. Then I was wheeled on a hospital bed through a pair of swinging doors. I thought this meant that I was being reborn. I found the sounds from the hospital interesting. There was a man talking with a very strong Scottish accent. I decided to get up and I saw that I was wearing my white and blue camouflage board shorts and I remembered who I was. I sat up and looked around. I was told to not get up so I kept on lying down. At the hospital I was put back on mood stabilizers. This made it hard for me to be motivated to do things and I wanted to stay in bed a lot. Several weeks later I was home alone and decided that it was game over for me. I connected some tubing up to my car’s exhaust pipe and sat in the driver’s seat.